First off, my apologies for the swappable ugli stick demise. It flew, but never well. Then when I saw a duplicate project on RCgroups, I dropped it. 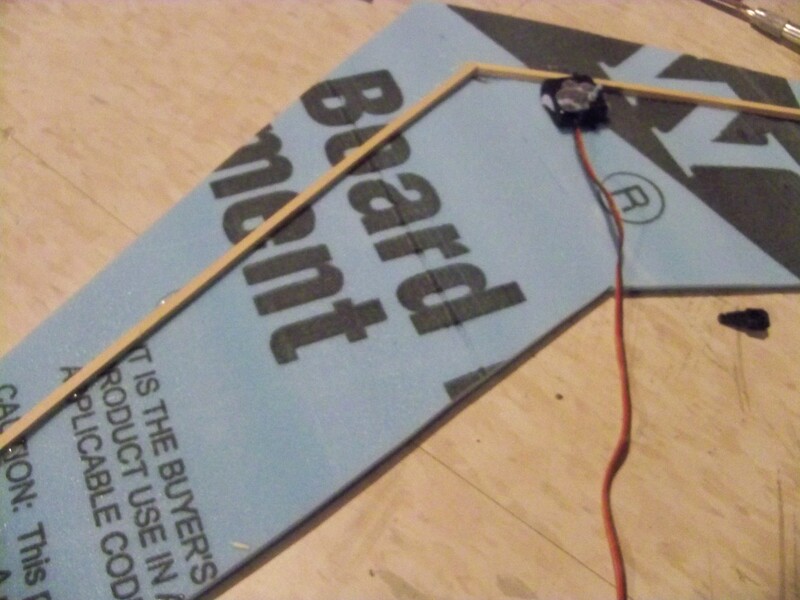 Now however, I have built a blu core flying wing which is capable of nearly 100 MPH on inexpensive equipment. Its dimensions are: 39 inch span, 4 inch chord at the tip, 9 inch chord at the root, 1.5 inch thickness at root, 1/4 inch at the tip. It is however, far stronger than the average blu core wing due to a construction method that I invented. 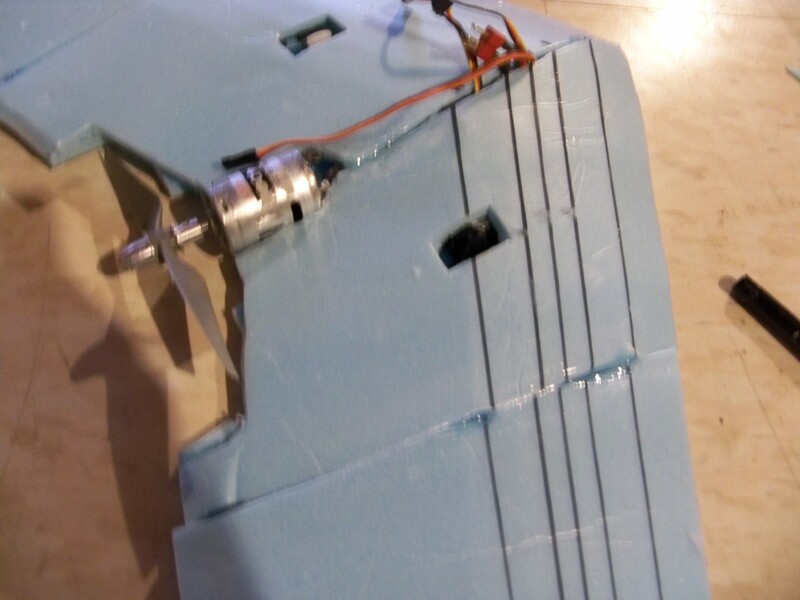 The strength comes from a gorilla glue mixed with elmers glue, which is not new, I know, but when the wing's leading edge is filled with this mix, It creates an surface which can withstand a full throttle vertical dive into the ground with little more than some wrinkling of the leading edge. How do I know this? I am not a good pilot, and blue planes against blue skies are hard to keep track of. EDIT: OKAY, I am a procrastinator. With out further ado, here is the build log of the wing. I do not have plans yet. I am not very good at using sketch up, and the scaling factors are way off when printed. 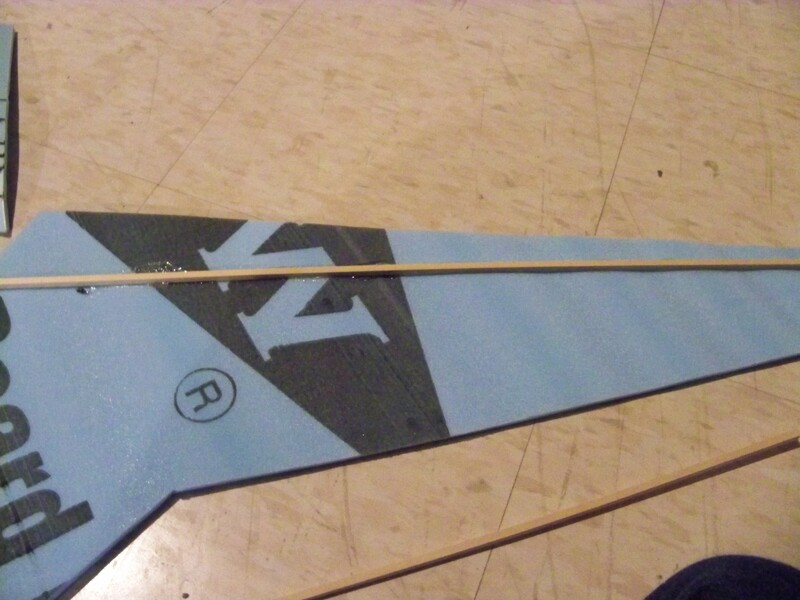 This wing has been tested as a Hi start glider, a slopie, a racer, a slow flyer, a combat wing, and an aileron trainer. How did you measure the speed? I am guessing an 80% airframe efficiency to be safe, coupled with a pitch speed of 124.296 mph with a 3 cell lipo, rounded down to 95 mph from 99.4 mph to be safe, because at my altitude, every thing goes faster! 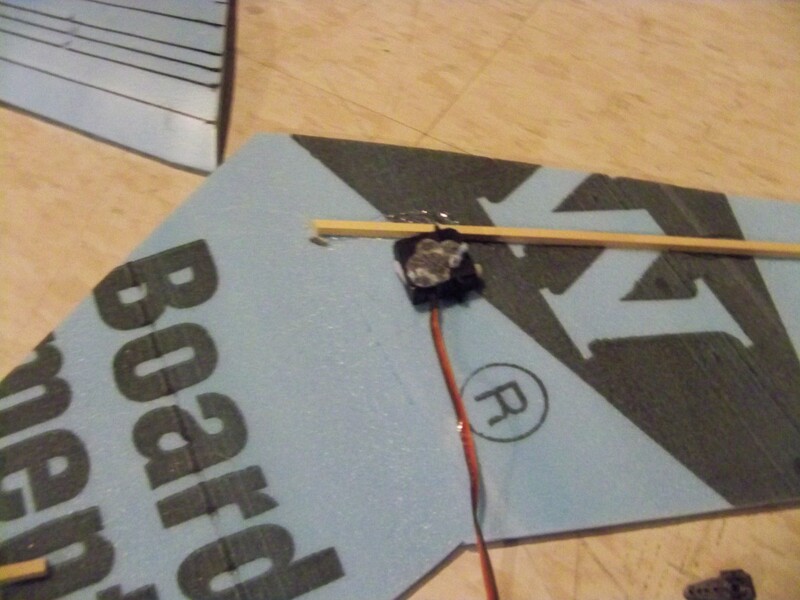 this calculation relies on a 5.5x5.5 apc sport prop on a floaterjet motor on a 3 cell (11.1 volts). Hmm, they were working earlier, I will repost shortly. First off, sorry for taking so long, I got sick, and homework piles up. Two sheets of Dollar tree foam board or Blue Fan fold foam. One dowel rod. 3/16ths works great. I will start the log shortly! I can't seem to post pictures. In a Pic's place it says: Attachment ----. when I click the link, it says: Invalid attachment specified. I finished building and photographing the wing, I just can't post Pics. Ok, the bugs are out, the kinks are ironed, and it flyers great! It is a smashing success... In more ways than one. This was the result of looping into power lines, the the power pole, then the ground. I picked up and flew it back to my house, then the nose broke. Bah - merely a flesh wound! Oh don't worry, It is now a 30" powered by a 300 on a 4.75X4.75. Rcsstarter is the free version, rc speedo the paid version. I'm not going to measure this one, as I know it can only putter at about 50 mph. When I return from Germany in 2 weeks, I will be ordering two Floater jet motors, and some Orx 615s if they are in stock. I Built mark 3 in the time from taking that picture to about 30 min ago. it is awesome on those 6 volt speed 400s that trick RC sells. I think I can prop it up to a 5X5.5, but 5X5 is excellent. The 2500 KV 400 melted its mount after 2 minutes at half throttle, but the 6 volt (2000 kv) has so much more power on a 2 cell and 5X5. Woohoo! I love this plane! After 10 versions of this wing ranging from the mark 1 speedster to the mark 9 floater, and a combat tested version, I am almost ready to give you the plans. Take note, the title of this thread has become a misnomer; this is also an aerobatic wing, slow flier, and combat wing. I am currently floored with a horrendous cold and Jetlag, but I am writing the build article, and drawing the plans for 4 versions of this flying wing. The versions are: Slow flyer, Speed 400 fun fly, speed 480 fun fly, indestructable 480 combat plane/ caterpillar killer , and indestructable combat plane with a floaterjet motor. I haven't posted much on this, but I have been building many prototypes for this wing, and constantly tweaking them for the best performance. A very fun, and cheap option uses the 2 for 1 zagi 400's from trick rc, a brushed esc from HK, a 1300 2 cell lipo, and 2 HK white servos. it is about $32 shipped to build this plane. For those of you who have a spare Hobbyzone SC brushed motor around, this motor on a 5x5 prop and a 3 cell will yield unlimited vertical on the 480 fun fly. I have only one more kink to iron out before I release the plans. Thanks for all the help and support guys! 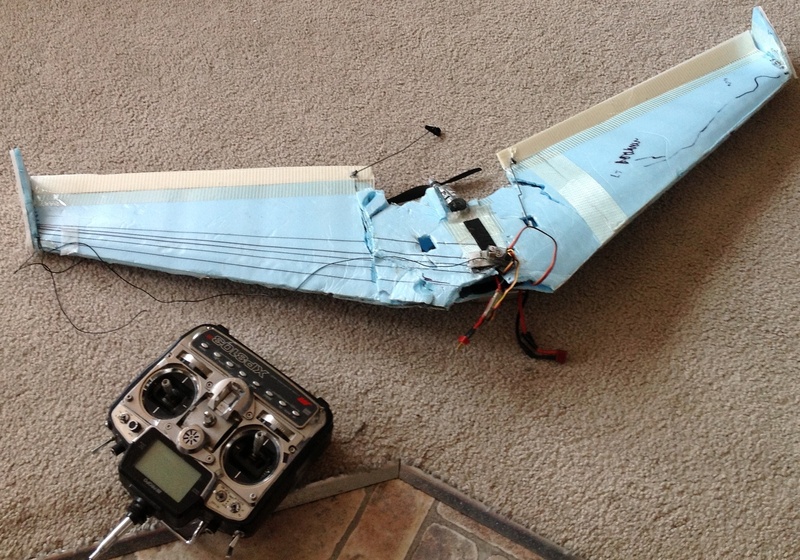 This is the mark three fun fly with a zagi speed 400. My dt foam combat version is not quite done, as I need the floater jet motor to finish it. These are some teaser pics. I couldn't tell on my screen. As this is my first build, feed back of any sort would be appreciated. 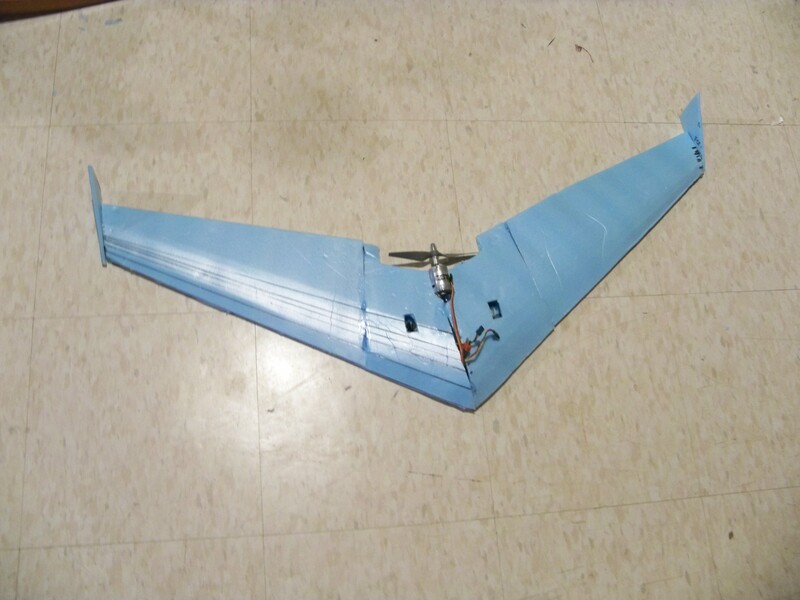 This wing has been tested as a Fun Flyer, Hi start glider, a slopie, a racer, a slow flyer, a combat wing, and an aileron trainer. I do not recommend it as an aileron trainer yet. I am still testing one with Dihedral for that purpose. This is a build log of the speed 400 funfly version. This is mostly pictures with a few tips. Note, NEVER use a 4.8 volt speed 400 on a 5x5 prop. This wing perished in a fireball after the motor caught fire on the 3rd flight! 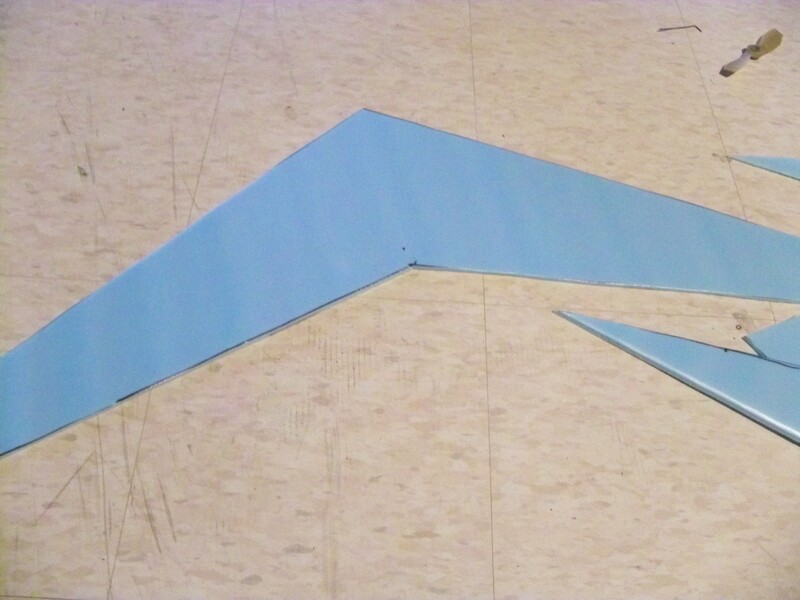 First, cut out a 9" root, 36" span, 3.5" tip, 10" tip sweep wing from one sheet of fan fold foam. Next, using the wing you just cut as a template, cut out two half wings, then at 1/2", 1", 1 1/2" and 2 1/2" marks at the root, crease the unskinned side of the foam slightly down to form a curved surface. Bunch up these lines at the wing tip in what every spacing looks reasonable, this can vary quite a bit with out changing the dynamics of the wing. Next, install the right spar 3" from the LE at the root, and 1" from the LE at the tip. The spar can be almost any piece of wood you have sitting around. I used 1/4" pine square dowel. 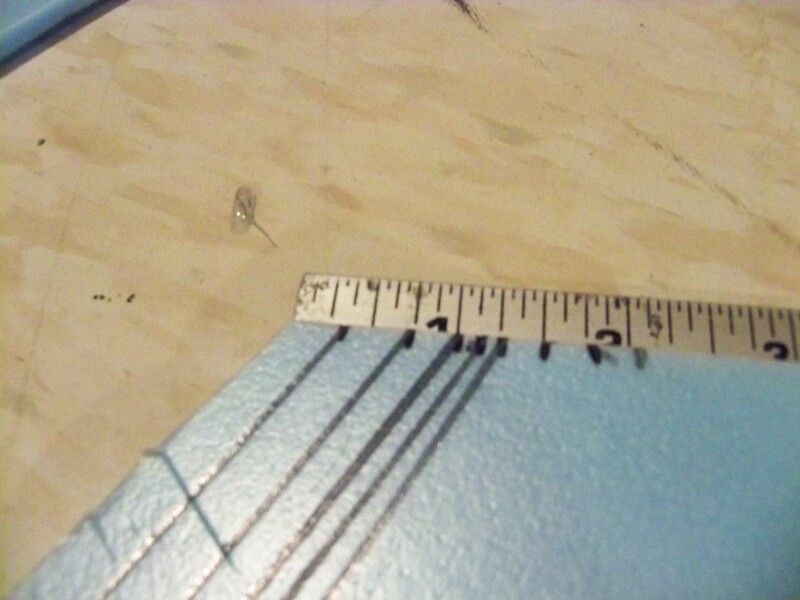 Trim it to length at the center, and cut it to a straight line as shown in the picture. Now install the servo. I recommend butting the servo up to the spar, and gluing it there, as I had a servo tear out of the foam in a High G turn. 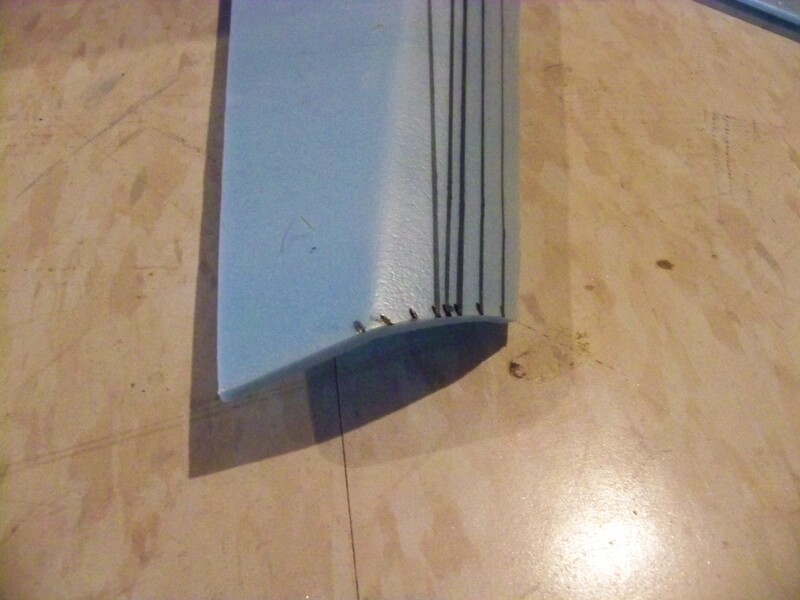 After the glue cools, install the left spar the same way as the right. Lastly, install the cross member between the two spars. This is crucial! Do not skimp on glue here, as this piece keeps the wings from folding. 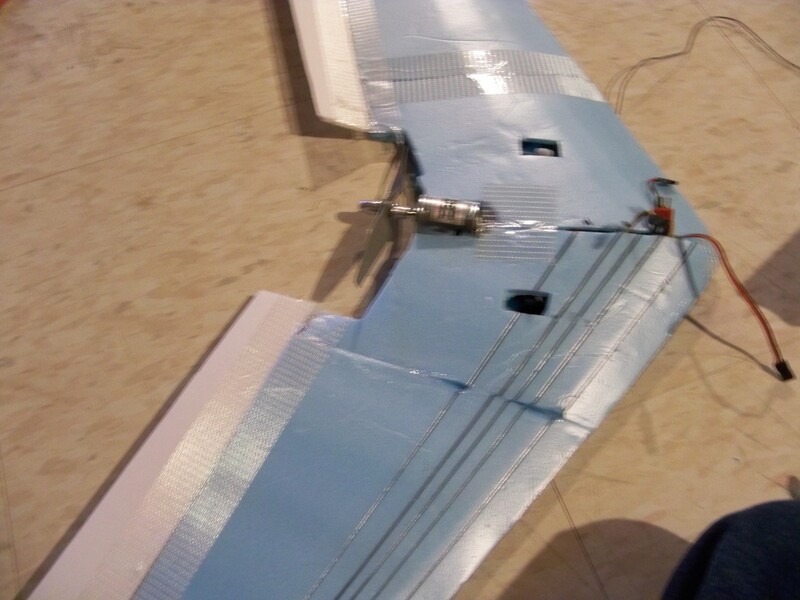 I will continue with the upper wing installation soon. Hmm, not showing up in new posts. 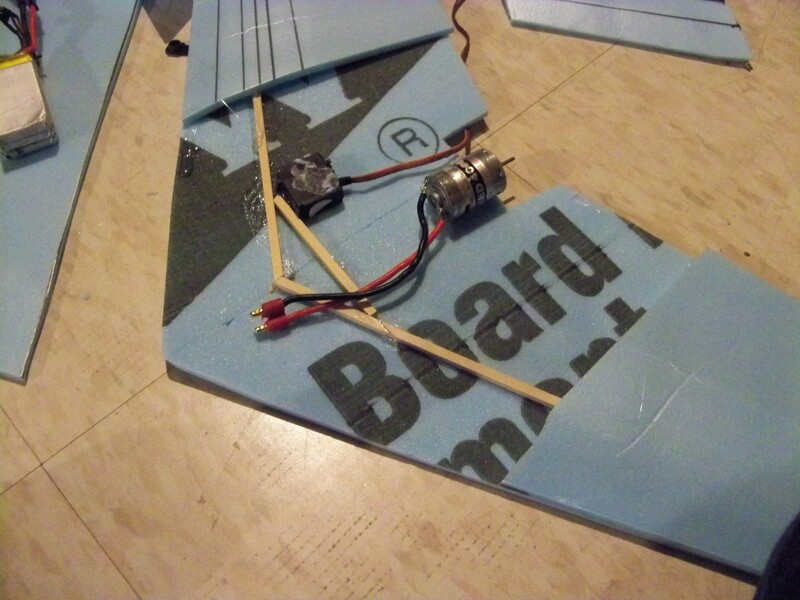 I forgot to mention, the wing works very well with a stick mount outrunner, but firewalls tend to be knocked off on hard landings.